This species is Garden Sorrel, a perennial salad and seasoning green with lemony tasting leaves, 6-12” long, borne in compact clumps that are productive for about 4 years. Space 12” apart for perennial plantings, or 8-10” for single season beds. Ideal salad picking size is 3-4” long. Larger leaves are cooked with fish, or to make a famous soup. 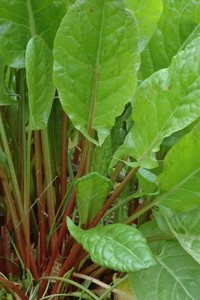 French Sorrel (R. scutatus) has smaller, rounder leaves, and is far too oxalic for salad use. Sheep Sorrel (R. acetosella) is the common weed that spreads by runners, and a nice little salad leaf if you already have it.